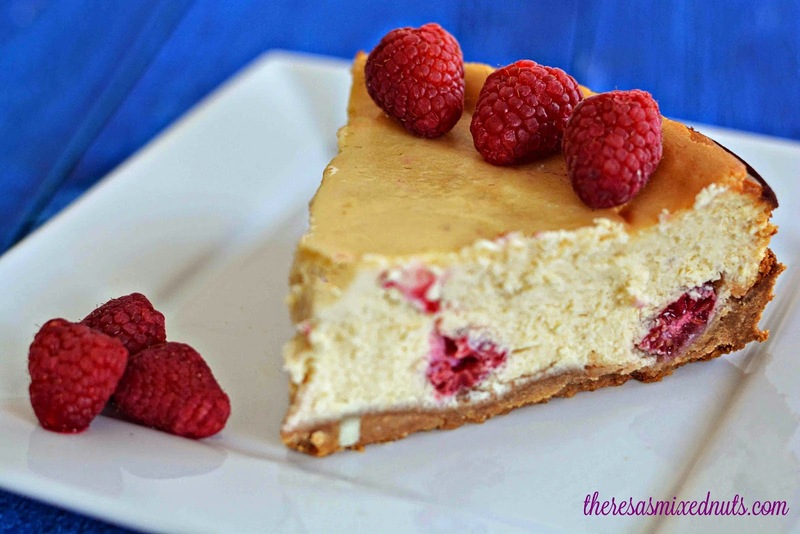 Theresa's Mixed Nuts: White Chocolate Cheesecake with Raspberries! Perfect Dessert for Easter! White Chocolate Cheesecake with Raspberries! Perfect Dessert for Easter! Forget pie. Forget cake. Cheesecake has always been my #1 love in the dessert department. 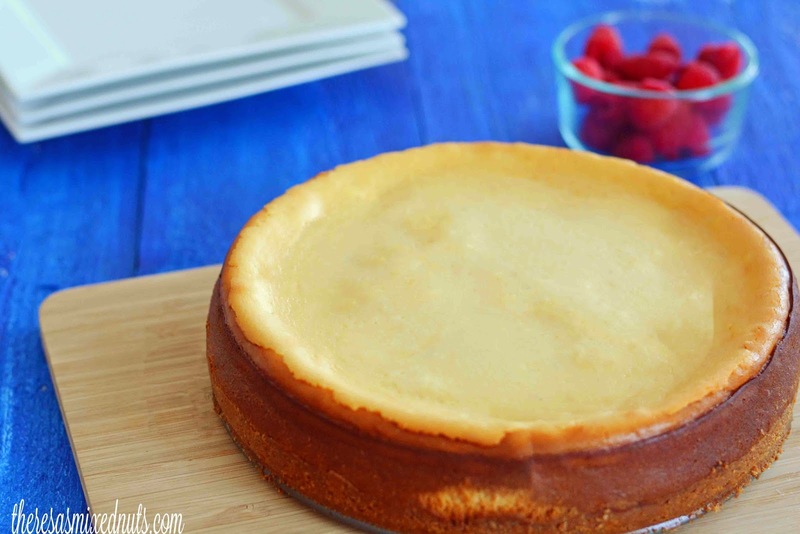 I've been trading cheesecake recipes with one of Jason's co-workers for the past year, and while he has given me some great recipes, I think the White Chocolate Cheesecake with Raspberries recipe I found on Golden Blossom Honey tops all of his any day of the week. I actually made this one for Valentine's Day, and it was gobbled up so quick, I thought it would make a perfect addition to our Easter dessert table this year. I have never done a white chocolate cheesecake before and couldn't wait to see how it was going to turn out. We found that the combination of white chocolate and raspberries gave the cheesecake an amazing punch of sweet flavor! What are you serving for Easter dessert this year? I have some co-workers that are crazy about cheesecake. Then I found out that Mica's nuts about it to. They'd love this. This has to be the most perfect recipe! 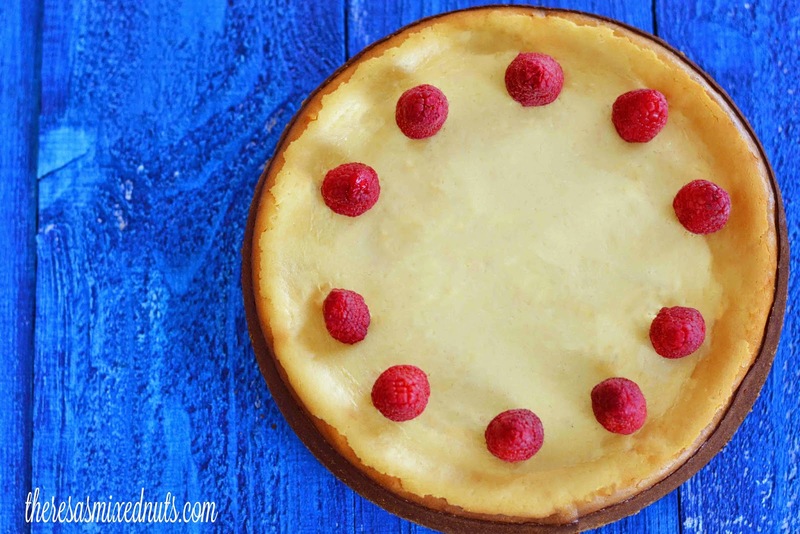 I love making cheesecakes and to have a recipe with white chocolate, honey and raspberries, I think this will be my favorite! Looks perfect for Easter. I have most ingredients too. Thanks, Theresa. This cheesecake looks so good to me! I love the things you make with honey! All I can say is: Mmmmmmm continued. Have a great Easter weekend, with loads of yummies for you and the kids. That cheesecake looks amazing! I love the addition of the honey and the white chocolate. Looks super tasty! I love cheesecake so I'll have to try it since those flavors sound delish. You had me at cheesecake and with white chocolate even better! I just love cheesecake and I'm so going to give this a try. Thank you for the recipe. To say this is the perfect Easter dessert is an understatement. We are suckers for a delicious cheesecake and the fresh raspberries are amazingly ideal for welcoming spring! This looks absolutely delicious. Who doesn't love cheesecake with fruit? You had me at cheesecake. I can't wait to try this recipe. I haven't had Cheesecake before. I'm not sure why. I think the word cheese (In a cake) has just always freaked me out.. But this? Looks mighty tasty! Cheesecake is my favorite and yours looks delicious. Mine always cracks- ugh I'll be making this on Saturday! This looks delicious. I love cheesecake and want to try this recipe. Love this, looks delicious and I bet it is that too! Cheesecake is my most favorite dessert in the whole wide world. Then carrot cake and then whatever is chocolate. LOL This looks yummy. Love cheesecake. I think we are having birthday cake to celebrate my Uncle's birthday. I haven't had cheesecake for awhile. I love cheesecake though . This looks yummy! a Honey recipe EVERY Friday? That's amazing and I'm in!! This one looks so good and I've never made anything like it. Wishing you a beautiful Eater! Your presentation is amazing!!! I am literally drooling right now this is a great presentation! I love the words chocolate and cheesecake. YUM! Oh I am having a moment. Ok better now. I want this . My Daughter made my Granddaughter a peanut butter cheesecake for her birthday. It looked good, but I didn't eat it. Your White Chocolate one looks good too.